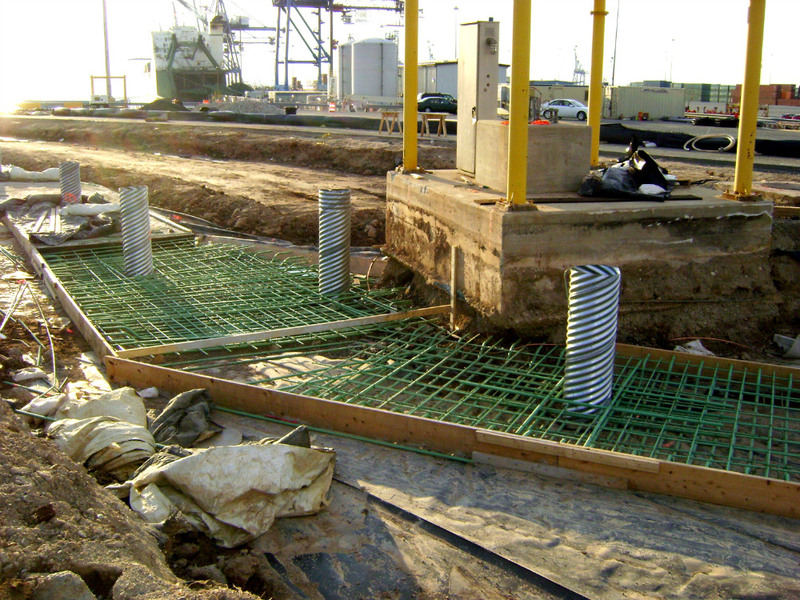 NRC was contracted to complete a project that included the installation of a Strain Relief Trench (SRT) at the Dundalk Marine Terminal in Baltimore, Maryland. The SRT is comprised of soft, flexible material and installed vertically into the area of concern. The SRT Trench backfill is composed of excavated COPR soils, bentonite slurry and peat. The trench is designed to act as a pressure relief zone by absorbing excess fluids and expanding without transferring pressure to the other side of the trench. By absorbing the expansion and lateral movement of the COPR soils, the SRT Trench protects the adjacent underground utilities from being crushed. The SRT trench installed at this area was designed to protect two 96-inch storm drain lines. The major components of the SRT, including COPR, bentonite powder and peat, were mixed in a specific ratio to form a slurry. The slurry was then pumped into the excavation trench. 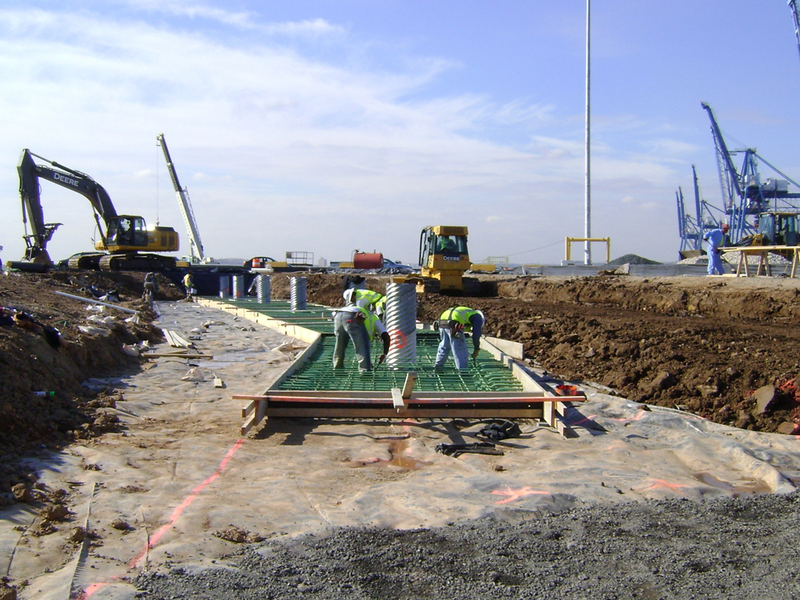 After the trench was completely installed, the work area was capped with a concrete slab. Sixteen relief tubes were installed into the SRT trench and extended up to finished asphalt grade. The relief tubes are designed to allow expansion and contraction of the COPR soils, by forcing the SRT backfill material up into the tubes during periods of COPR soil expansion. Cast iron frames and covers were installed over the relief tubes at the final grade and 7 inches of paving was placed to restore the site to its original condition. 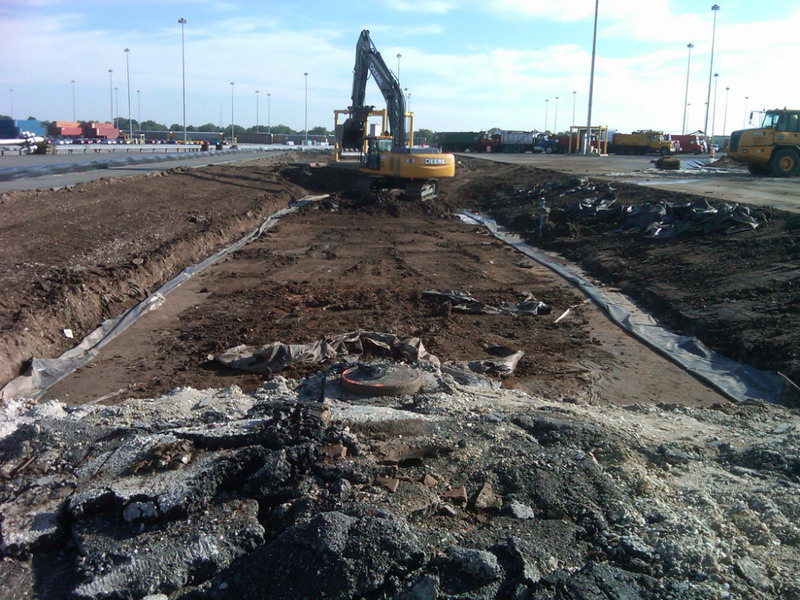 Installation of SRT protect underground 96” storm drain lines in busy marine port. Mixing and installation of slurry into excavation trench. Installation of 16 relief tubes to allow expansion and contraction of COPR soils.